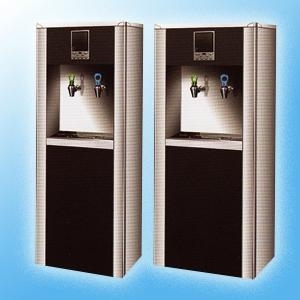 Purifier & step-heating water dispenser adopts automatic microcomputer control technology to make sure the temperature of water is constant. It is the composition of the electronic temperature sensing technology, water level electrode detection technology and polyurethane foam insulation technology. For achieving the minimum temperature of healthy drinking water, it obtains the signal through the water level electrode and the high precision temperature sensor, to controls the heating pipe and Solenoid valve by computer. 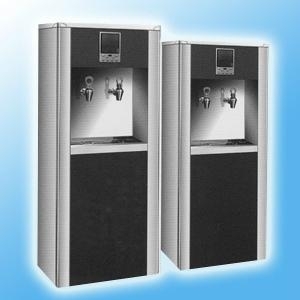 Purifier & step-heating water dispenser adopts layered heating and layered supplying water to coordinate the boiling water temperature and the amount of water (water level). The machine adopts the laminar flow theory of fluid mechanics, which is the physical properties of hot water is lighter than cool water, to avoid mixture of unboiled water and boiled water. With step-heating technology, it can make sure layered heating and one-time critical boiling. 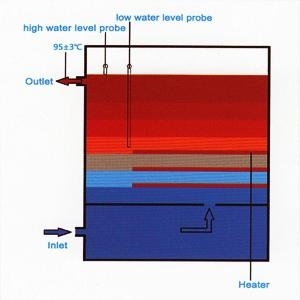 Layer heating, one-time critical boiling, the microcomputer precise control of water inflowing time and speed to ensure the supply of 100% pure water. For the first time, it can provide continuous hot water without waiting after 3 minutes of turning on. With the device of clean scale and the system of UF/OR, it can improve water quality, eliminate the scale effectively and extend the life of equipment.